The annual National Fallen Firefighter Foundation’s Memorial was held at the National Fire Academy in Emmittsburg, Maryland. 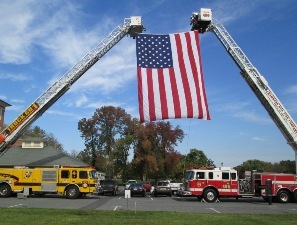 Truck 1 (Chambersburg) and Truck 456 (Chambers Hill) provided one of four ladder arches on the grounds of the campus. Participants in the event were Captain Tim Ebersole, FF Tony Albright, FF Kelly Knepper, FF Jim Picking, and ES Chief Leonhard. The CFD provided Honor Guard participants for the many activities associated with the NFFF Memorial Weekend 2014. 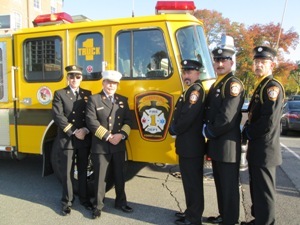 FF Albright, FF Knepper, and FF Picking took part in ceremonies and events in Arlington, at Mount Saint Mary’s College, and the National Fire Academy. FF Albright served as Deputy Commander for the Candlelight Vigil. Job well done by our Honor Guard members.